One of the things I appreciate the most is the way the author speaks about educators and recommendations she makes to parents in how to interact with people in a school. Too often, it seems that educators are under attack, and not respected for the training and work they do daily. This author’s attitude is refreshing! She recommends that parents speak positively, professionally and persistently (she calls it the rule of P3). She actually puts in email examples of what not to do and what to do. Throughout my school career, I got a lot of those emails that look more like “what not to do” rather than “what to do”. She has a great understanding of what is happening in education right now, and provides easy to understand explanations, from high stakes testing, to STEM/STEAM, the Common Core and IEPs and 504s. This is a fantastic resource for parents who may not understand all the complexities of today’s education environment and need a quick explanation of everything. Her chapter on Kindergarten was especially relevant to me as the mother of a kindergartener. It was great to know both our school and our family are on the right track for our daughter, and I will definitely use her tips for transitioning my son into school in the near future. I also love that she emphasizes extended learning to home, but to keep it fun and relaxed. It should not feel like more school when playing at home. She emphasizes the importance of play, which is right in line with my thinking at Encourage Play. I love her discussion of ways to foster a confident, connected and resilient child. She says kids need an accepting adult, a buddy, and a competence (strength or interest). I completely agree with this! Part of why I started Encourage Play was to help kids find at least one friend who is good to be around. She has a chapter on nutrition, which I think is also very important for good functioning. I’ve created Pinterest boards for this, of course! It has inspired me to keep looking for healthy recipes and snacks for kids. 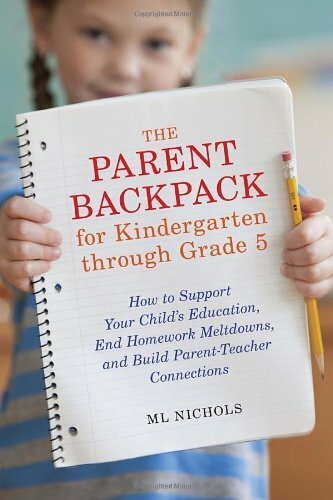 I would highly recommend this book for any parent of a child in Elementary School or with a child who will soon be headed there. Great resources and great website!